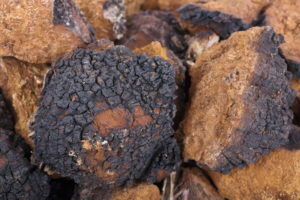 Chaga mushroom is a medicinal mushroom. It is considered a popular remedy in folk medicine in Lapland for the treatment of diabetes, gastritis, Crohn’s disease, cancer, psoriasis, asthma and many other diseases. The Latest research shows that the Chaga Mushroom is one of the strongest antioxidant substances on the basis of its high ORAC value. Its extremely positive effects on the immune system have been confirmed by numerous scientific studies. The Chaga mushroom increases physical and mental performance and is also an insider tip for the treatment of cancer. Basically, the Chaga Mushroom has anti-inflammatory benefits and activates the immune system. That is why it is a natural remedy for all autoimmune diseases, such as multiple sclerosis or ankylosing spondylitis. As a gentle home remedy for rheumatism and arthritis, it is appreciated by many people. For a healthy, beautiful skin, the Chaga mushroom is the secret tip. Age spots and pimples disappear through its internal and external application. The wild Chaga mushroom has been used for many centuries in Lapland as a tonic in the form of Chaga tea. The Chaga mushroom (Inonotus obliquus) is recognizable by its bulbous form and the black surface, which is extremely hard and sharp. From the outside, the Chaga mushroom looks similar to charcoal. It can be somewhat brittle on the outside, so that parts of the surface can be broken off by hand. The size of the visible part of the Chaga mushroom varies from 5 to 60 cm in diameter. The inner part is yellow to rust brown, sometimes crossed by white veins. The interior is often hard, sometimes with a cork-like structure. The visible Chaga mushroom parts at the birches are several centimeters thick, but can be more than half a meter wide. The pores are initially brown with silver shine, later black-brown. 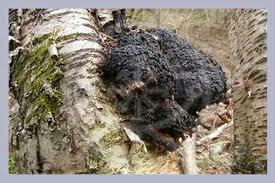 Chaga mushroom usually grows on birches older than 20 years old. In the columns of the birch bark, the Chaga spores set and grow into the trunk over time. On the outside Chaga forms the visible, black crust. Young specimens look like tubers, the more than 5-year-old Chaga mushrooms are reminiscent of solidified lava. The Chaga mushroom lives in a symbiosis with the birch until the host tree dies. His lifetime is usually 10 to 20 years. Some specimens, however, are up to 40 years old. After the host tree is dead, the Chaga mushroom develops its fruiting body. This consists of a gray chitin mass, which can be up to 2 meters long. After maturation of the fruiting body, the Chaga mushroom releases its spores. After that it decays within a few days. The fruiting body is not used for making tea. 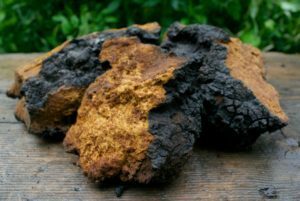 What we call chaga is the mycelium of the fungus, which is visible in contrast to other medicinal mushrooms. The Chaga mushroom is classified as white rot fungus, which developed about 300 million years ago. These types of fungi are able to metabolize cellulose and lignin from trees. Almost all medicinal mushrooms are white rot fungi. Inonotus obliquus belongs to the genus of Schillerporlinge. Other Schillerporlinge are, for example, the oak Schillerporling and Zotiger Schillerporling. Inonotus obliquus, Chaga, Czaga or Chaga mushroom? Inonotus obliquus is the scientific name. In German-speaking countries Chaga is also referred to as slate Schillerporling. Other names are Chaga mushroom and Czaga. The Chaga mushroom grows mainly in Lapland, Russia, Canada, Korea and Japan. In Mongolia and China it can be found in some areas. The medicinal mushroom can also affect alder, beech and some other deciduous trees, but only birch-growing chaga mushrooms are important for use as a vitalizing agent. Non-birch chaga mushrooms were never used for healing purposes. The content of different minerals varies depending on the location and climate in which the Chaga grows. The medicinal mushroom contains a lot of manganese and zinc in comparison with other foods. Betulin and betulinic acid are medically active substances of the birch, which accumulate in the chaga mushroom. Basically, the colder the climate, the more nutrients and antioxidants are formed in the Chaga mushroom. With its vital substances, the medicinal mushroom protects against the harsh climate. Inonotus obliquus is considered an extremely strong, natural antioxidant. Of all the medicinal mushrooms, it has probably the greatest variety of medicinal properties. Already 900 years ago, the Chaga mushroom in Lapland and Siberia was used as a tonic and remedy. Maybe even much longer, however, the first written mention was the healing of the Ukrainian Grand Duke Vladimir Monomach (1053 – 1125) of lip cancer, by Chaga tea. Traditionally, this black medicinal mushroom was used against cancer, indigestion, ulcers, Crohn’s disease and tuberculosis. In the past, the Lapps (Finland) and the Khanty (Russia) drank chaga tea every day, as many people today drink coffee every day. Among these peoples, there were very few cases of cancer and other diseases. A Russian doctor was surprised to hear that rising numbers of cancer were reported everywhere, but he had virtually no cancer patients in his province. He noted that people drank Chaga Tea on a daily basis and concluded that people were protected from cancer. There are also reports of medicinal use of the Chaga mushroom from North America, Korea and Japan. The Chaga mushroom contains many substances with tumor-inhibiting effects. In particular, melanin, polyphenols, beta-glucan, triterpenes, SOD have come to the fore here as potent vital substances. However, the Chaga mushroom contains many more substances that have not yet been researched or are not yet known. Estimates assume about 200 unknown substances in the Chaga mushroom. Animal experiments have repeatedly confirmed the inhibition of the growth of cancerous tumors. The anti-cancer effect is probably due to the interaction of many antioxidants. The ingredients of the Chaga Mushroom form a healthy cocktail that effectively protects the human body cells from damage caused by radioactive radiation, free radicals, stress and environmental pollution. There are only a few scientific studies with people who studied the tumor-inhibiting effect of Chaga mushroom, however, a study from Poland showed a significant improvement in physical symptoms in cancer patients. However, Chaga mushroom has always been widely used in folk medicine in Russia and Lapland as an anti-cancer drug. The cure of the Ukrainian Grand Duke Vladimir Monomakh is just one example. From the ancient traditions it is clear that in earlier centuries people knew very well about natural remedies. Due to the prolonged use of the Chaga mushroom against cancer in folk medicine in Russia, the interest of some Eastern European researchers was aroused. In 1954, the well-known Polish physician Prof. Dr. med. Marek Gatty-Kostyal the Chaga Muhsroom. He was the first scientist to discover his tumor-inhibiting effect. His findings have been confirmed by several Polish and Russian researchers in subsequent studies. The research led to the development of Befungin, a hot water extract used to treat cancer. Befungin consists of Chaga extract, cobalt salt and alcohol. The Chaga mushroom was approved in 1955, after detailed investigations as an official drug (Befungin) in the former Soviet Union and registered. The famous Russian writer Alexander Solzhenitsyn described in his semi-autobiographical novel “Cancer Ward” how the Chaga mushroom was used as cancer medicine in Russian hospitals. The main actor of the novel does not trust the doctors and is looking for new remedies. He hears about the Chaga mushroom and then goes in search of the mysterious remedy in the forest. He finds the Chaga mushroom and survives. Alexander Solzhenitsyn was cured of cancer in 1957 through surgery and treatment with Chaga tea. At the beginning of the 1960s scientific studies in Russia and Finland revealed a lot of evidence of the extraordinary beneficial effects of the Chaga fungus on breast cancer, liver cancer, uterine cancer and gastric cancer. In addition, the Chaga mushroom apparently lowers high blood pressure and prevents diabetes. Polish studies from 1998 showed that the Chaga mushroom could have an inhibitory effect on the growth of tumors. Unique is the high content of melanin in Inonotus obliquus. The melanin gives the Chaga mushroom tea the dark color. Melanin is considered a powerful antioxidant and anti-cancer drug. This substance is not present in any other fungus in this high concentration. Melanin has a reputation for delaying the graying of hair and improving mood. The anti-mutagenic effect of betulin in the white part of the birch bark (from which Chaga largely feeds) inhibits the oxidation of free radicals and supports the production of interferons which aid in DNA repair. The anti-cancer properties of betulin and betulinic acid (chemicals that can be isolated from birch) are therefore discussed as a potential alternative to chemotherapy. In studies with mice, betulin significantly inhibited the growth of skin cancer. As soon as betulinic acid enters the cancer cells, this leads to apoptosis (programmed cell death) in the tumor. Betulinic acid appears to act selectively on cancer cells because the pH level in tumor tissue is lower than in healthy body cells. The Chaga mushroom contains betulinic acid in a form that can be metabolized by the body and, in addition, a wide range of immunostimulant plant compounds. However, the anti-cancer effects of Chaga mushroom are based not only on the betulin, but on its large variety of active ingredients. What Doctors Say to Chaga Mushroom? There are at least 150 medicinal mushrooms in the world that can inhibit the growth of various tumors. Especially cancers of the stomach, esophagus, intestine and lungs. Many researchers, such as Dr. Karl Maret and his colleague dr. David Winston says that Inonotus obliquus is the strongest anticancer medicinal mushroom. The Chaga Mushroom is a natural remedy that cancer patients can easily consume. The organism is enormously strengthened by its active ingredients in the fight against cancer. Thus, the patients can lead a normal life, despite the serious diagnosis. If Chaga tea is taken at an early stage of the disease, it can help alleviate the pain and prevent further spread of the tumor cells. In Russia, cancer patients are advised to use the chaga mushroom if surgery or radiotherapy is not possible. For the cure of cancer, a longer treatment with the Chaga tea is necessary according to the Russian researchers. For at least 1 year, patients must take Chaga tea in high concentrations daily. Two studies have found that the Chaga fungus has an inhibitory effect on the flu and other viruses. One of the active ingredients (inotodiol) has been shown to be effective against influenza A and B. The anti-viral effect is probably based on the content of polyphenols. Japanese studies have confirmed the virus-inhibiting effect on HIV-1 (protease inhibition). The historical use of Chaga mushroom as a virus-inhibiting and anti-inflammatory agent is based on the fact that the medicinal mushroom helps the body to stimulate its own immune system. The chaga mushroom contains beta-glucans, which are part of its cell structure. Beta-glucans have recently been scientifically studied for their positive effects on the immune system. Beta-glucans are able to attach to and activate the white blood cells (leukocytes). Leukocytes also called phagocytes are an important part of the immune system. They fight invading viruses, for example in a gash. Beta-glucan significantly increases the lifetime of leukocytes. This effect lasts up to 20 hours after taking Chaga tea. This means that the leukocytes can destroy more viruses and germs and the immune defense is strengthened enormously. The Chaga Mushroom contains a variety of terpenes, which in turn support the function of the thymus and spleen. The spleen stores leukocytes, so it is the seat of the immune system. The triterpenes in the Chaga mushroom help the pancreas to produce healthy leukocytes. Furthermore, Chaga contains anti-cancer polysaccharides and triterpens. The chronic fatigue syndrome, according to recent scientific findings caused by a dysfunction of the immune system. This is probably the reason why many people affected by this condition feel better when they drink the Chaga tea. The Chaga mushroom balances the immune system and helps to rebuild the physical strength. Much of the healing potential of the Chaga mushroom is explained by the fact that it is one of the most powerful and concentrated antioxidants. Antioxidants improve health and slow down the aging process by neutralizing free radicals and protecting body cells from damage. Chaga is the “heavyweight champion” in the field of antioxidants. The wild Chaga mushroom has the highest ORAC value ever measured by a natural food! Compared to other foods that are rich in antioxidants, such as blueberries and pomegranates, the Chaga mushroom contains more antioxidants. This means he has more potential to protect the body from free radicals. The Chaga mushroom also has the strongest antioxidant effect compared to other medicinal mushrooms. It also shows antibacterial, anti-viral and anti-inflammatory properties and is known as liver tonic and immune stimulant. A Korean study looked at how the Chaga mushroom affected obesity in mice. For this purpose, the mice were fed with fatty foods. At the end of the study, it turned out that the chaga mushroom protected the mice from obesity and diseases caused by eating too much fat. It has also been found that the Chaga Mushroom lowers excessive blood sugar levels and is therefore of great help to diabetes patients. It also reduces high blood pressure, with no side effects, such as chemical blood pressure medication. Asian researchers believe the Chaga mushroom helps maintain youth and increases longevity. He also strengthens the life energy. Chaga mushroom chunks dryThe Chaga mushroom can be used as a hot water extract for the treatment of cancer or against other diseases such as diabetes, in the form of chaga tea or alcohol extract. If you use the medicinal mushroom for self-treatment, it is easiest to drink it in the form of tea or for external use as a tincture. As a precaution, 1 or 2 cups of Chaga tea are enough per day. For the treatment of diabetes, psoriasis, Crohn’s disease, atherosclerosis and other autoimmune diseases, 2 cups of Chaga tea a day are a good dosage. For the treatment of cancer, the intake of at least 4 cups of Chaga tea of ​​250 ml per day is essential. In the case of cancer, Crohn’s disease and other serious illnesses, a naturalist-oriented doctor should always be involved in the treatment. Chaga mushroom tea can be made from fresh chaga mushrooms, but usually it is first dried. The chaga mushroom has to be cut into small pieces. After chopping, cook 3 chaga pieces (about 10 g) together with 500 ml of water for 10 minutes. Then the Chaga tea is ready to drink. For a tea with a high medicinal effect, it may be necessary to cook the chaga chunks for 12 to 15 minutes. The tea tastes similar to coffee with a slightly milder note. Some people even think it tastes of vanilla. If you want to prepare a light Chaga tea for tasting, take 2 Chaga pieces to 300 ml of water. For a stronger tea with a strong antioxidant effect, take 4 pieces of Chaga Mushroom. You should drink the Chaga tea 2 times a day 1 hour before meals to enjoy the health benefits. However, I recommend that you start gently with a cup of Chaga tea daily and do not overdo it before you know how your body reacts to it. According to research into the anti-cancer effects of chaga mushroom, uncooked extracts have no protective effect on cancer in mice. Cooking apparently activates substances that prevent cancer cells from growing. Both the experience of folk medicine, as well as laboratory research, therefore show that it is wise to cook the chaga mushroom chunks when the tea is consumed for medicinal purposes. It is important to cook the chaga mushroom in a stainless steel pot. Do not use aluminum because this metal can release toxic substances into the tea water. Let the Chaga mushroom cook with lid, so that the valuable substances do not evaporate. The Chaga tea can be supplemented with other spices and herbs, such as cinnamon, ginger or chamomile. Please note that the Chaga pieces can be boiled up to 20 times. After that new pieces have to be used. A tincture of the Chaga mushroom, alcohol and water can also be effective, as Russian studies have shown. For the preparation of alcoholic extracts take vodka or 60% pure alcohol if you want to make a tincture. Put ground chaga mushroom in a glass, so it is half full. Then fill the glass with vodka and leave the medicinal mushroom in the vodka for 2 weeks. Then filter the liquid through a coffee filter. 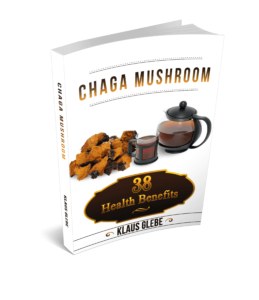 Take 3 tablespoons of this chaga mushroom extract daily. The extract is an important supplement to Chaga mushroom tea, especially in the treatment of cancer. Store the Chaga Mushroom Extract in a bottle, preferably in the fridge. That’s how it lasted for years. There are many products that Chaga Mushroom insists on, but only a few contain, the real, wild Chaga. The emphasis here is on “wild”. Only the wild Chaga mushroom from subpolar areas and clean environment is used by the experienced users. The best conditions are the Chaga mushroom in the forests of Lapland. Here, in the untouched nature, with a healthy population of birch trees, the real, wild Chaga mushroom matures with an extremely high content of vital substances. Another factor that makes the wild Chaga mushroom from Lapland so valuable is the extremely cold climate. The thermometer drops to minus 40 degrees Celsius in the icy forests of Lapland. The colder the climate, the more vital substances the Chaga mushroom forms. Why is that? With the antioxidants, the Chaga mushroom protects itself from the low temperatures, from dying in this harsh nature. Very few living things have the power to survive at minus 40 degrees Celsius. Only the wild Chaga mushroom should be used for human consumption. Chaga from China or Eastern Europe often comes from heavily polluted areas. The Chaga mushroom stores environmental toxins and radioactive radiation, so only Chaga from clean forest areas is recommended. Not like the wild Chaga mushroom from pure nature are all bred copies. Farm-grown chaga mushroom is always ground to powder and sold in capsules or loosely packed in bags. However, Chaga powder has no medicinal value, due to the hardly existing vital substances. Bred Chaga mushroom products are harvested after a few months. 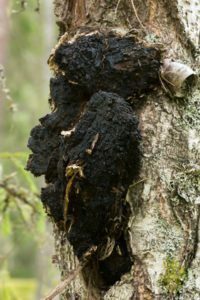 The wild Chaga mushroom must grow for at least 5 years before it is allowed to be cut. Therefore: Only the wild Chaga mushroom from clean areas contains the vital nutrients in high concentration. However, high-quality Wild Chaga Mushroom is an extremely powerful antioxidant and effective remedy. In diabetes, psoriasis, cancer, arteriosclerosis, gastric ulcers, gastritis, inflammation and many other ailments, the Chaga mushroom is an invaluable helper. If you incorporate the Chaga mushroom tea in your daily diet, you will enjoy many positive effects. Your physical and mental resilience will increase enormously. You will sleep restoratively, get a nice skin and feel fit and vital.